What conditions are required for a monetary union to work? WHAT are the necessary requirements for a common currency to actually work effectively to the benefit of all its members? Why do the dollar-zones in the US, Canada and Australia not experience the same level of crisis, divergence and stagnation as the Eurozone has been plagued with? Simply put, the institutions in place in federal states such as these allow for the smooth, timely and effective recycling of excess profits from surplus states to those experiencing deficits. They also have central banks that have a mandate to ensure full employment, as well as price stability. In comparison, following the Bundesbank model, the ECB’s mandate is solely to maintain price stability and it is not to concern itself with employment. When a downturn or crisis hits a common currency area, it will cause an asymmetric shock unless there has been sufficient convergence in the economies of the union. Divergent economies would be affected differently by different external and internal developments. This danger was understood by the architects of the euro, but for ideological reasons they focused only on attempting to achieve convergence in government debt and deficit levels at Maastricht and ever since, instead of looking at the more important role of divergence in balance of payments between members. In 1961, economist Robert Mundell articulated his ‘optimum currency area’ theory on how currency unions could work to overcome asymmetrical shocks. The adjustment mechanisms identified through this theory include price and wage flexibility; mobility of labour and other factors of production; financial market integration; a high degree of economic openness; the diversification of production and consumption; similar inflation rates; fiscal integration; and finally, political integration. Some of these mechanisms can be seen to work effectively in the US. The three most important factors in place in the US economy identified by Stiglitz and others are: (1) the ease of migration across states, (2) federal spending on national programmes, and (3) the fact that the US banking system is a federal and not state-based system. If one state in the US experiences a shock, workers can easily migrate to another state in a better economic condition in order to look for work. Technically there is freedom of movement of labour in the EU, but in practice migration within the US is far easier due to the fact states share a common language, a common culture and national identity, and the same access to federal welfare programmes. National government programmes such as social security and Medicare are available across all states, which means that if one state is experiencing a downturn, the federal government will automatically recycle surpluses towards the state in trouble in the form of, for example, increased unemployment benefits. Around one-fifth of GDP is spent at the federal level in the US. The federal government can also choose to boost investment or spending in certain federal projects at the state level in order to aid economic recovery. By comparison, in the Eurozone there is very little fiscal capacity to redirect funds towards depressed states because the European budget is around one per cent of member states’ GDP. Almost all spending occurs at the member state level. US banks are also guaranteed at the federal level by the Federal Deposit Insurance Corporation, preventing capital flight from one state to another in times of crisis. Clearly the EU lacks similar institutions. But with the exception of a common deposit insurance scheme, the creation of such adjustment mechanisms in the Eurozone is either impossible in the short-to-medium term, or completely undesirable from a left standpoint by virtue of the fact that increased economic, fiscal and political integration require unacceptable trade-offs in the ability of people to participate in the decision-making process democratically at the local and national level. Of the various adjustment mechanisms identified by optimum currency area theorists, the Eurozone’s founders have clearly focused single-mindedly on attempting to achieve ‘flexibility’ of wages. Countries inside a common currency area cannot engage in competitive devaluations by devaluing their currency to make their exports more competitive. But they can implement policies domestically to bring about an ‘internal devaluation’ – lowering their real exchange rate vis-à-vis their neighbours. The main way this takes place is by compressing or reducing wages, which causes prices to fall. Germany has consciously implemented this policy for several decades, at the expense of German workers, millions of whom are working but living in poverty. This long-term strategy was intensified in 2003 under the then social-democrat/Green coalition government, which carried out a radical and vicious reform of the labour and welfare systems entitled Agenda 2010. The competitiveness of prices largely determines the performance of a country’s exports, and the key factor determining prices is the nominal unit labour cost (the nominal unit labour cost is the ratio of labour cost per employee to productivity – the value added per worker). Unit labour costs in Germany stopped growing in the mid-1990s. Between 1998 and 2007, the rise in unit labour costs in Germany was zero. But in the rest of the Eurozone over the same period, average wage costs mainly increased with inflation, of around 2 per cent per year. This difference greatly increased the competitiveness of German exports and reduced it for the exports of other Eurozone members. So the success of Germany’s economic model is at the expense of the rights and living standards of its workers. The Agenda 2010 strategy has been deepened under successive governments and by 2015, more than 12.5 million Germans, out of a population of 80 million, were living in poverty in Europe’s “economic powerhouse”. The EU’s focus on structural reform, particularly labour market reform, with a view to achieving increased “flexibility” has been a constant feature of its agenda since Maastricht. This was a major element of the Jobs Strategy of 1994, and the Lisbon 2010 Agenda adopted in 2000. The Lisbon Agenda originally set out to make the EU “the most competitive and dynamic knowledge-based economy in the world” by 2010. It included an economic pillar, a social pillar and an environmental pillar. In 2005, the Lisbon Agenda was revised by the European Council and Commission. Their verdict was that the agenda was failing to achieve its goal, and so they decided to drop the social and environmental pillars and focus on the economic pillar. In 2010 the Lisbon Agenda was relaunched as a new 10-year plan, the Europe 2020 strategy – “an agenda for new skills and jobs: to modernise labour markets by facilitating labour mobility and the development of skills throughout the lifecycle with a view to increasing labour participation and better matching labour supply and demand”. The “progress” of member states in implementing structural reforms that will facilitate downward movement on wages is monitored through the European Semester process, a yearly cycle of policy “coordination” between member states and the Commission. In spring each year, Member States submit their plans for managing public finances – including keeping debt and deficits within the Stability and Growth Pact limits – and their National Reform Programmes to achieve “smart, sustainable and inclusive growth”. These plans are then assessed by the Commission, which proposes country-specific recommendations to member states, which are discussed and adopted by the Council. Then each autumn member state governments are graciously permitted to present their draft national budgets to their respective parliaments. The Five Presidents’ Report of EU leaders of 2015 proposed the creation of National Competitiveness Authorities to advance this agenda further. The Eurozone elites believe (or claim to believe) that if only “wage rigidities” in the member states were overcome, both unemployment and trade imbalances would disappear. If only a country’s population could be forced to work for poverty wages, there would be a job for everyone; and the resulting stagnation in domestic demand would mean prices would fall and this country’s real exchange rate, which had become misaligned and risen too high, could regain its balance. This view underpins the repeated attacks on the rights and wages of French workers, set to intensify fiercely under President Macron, as well as underpinning the EU’s overall agenda and forcing structural reforms in the member states in order to increase productivity and competitiveness – and profit, of course. The austerity imposed by the Troika was not only designed to regain market “confidence” in peripheral governments, but also to facilitate internal devaluations in member states by a form of shock therapy. Of course, this adjustment facilitates not only the reduction of trade imbalances but also a sharp increase in the amount of wealth transferred from labour to capital. There has certainly been an internal devaluation process in the Eurozone countries, affecting primarily the peripheral economies. But as Stiglitz points out, “this has not worked – or at least not fast enough to restore the economies to full employment. In some countries such as Finland, low inflation not been enough to even restore exports of goods and services to the levels before the crisis”. An increase in exports in these countries should have boosted growth and employment. But with the exception of the hugely distorted “globalised” data from the Irish economy, this has not been the case. The restoration of trade balance that the Eurozone has experienced since the crisis has largely been due to the fact that imports fall when demand stagnates – “one can achieve a current account balance by strangulating the economy”. For the crisis countries, the reduction in their trade deficits post-crisis largely resulted from a reduction in imports and not an increase in exports. Crucially, internal devaluations also increase the level of debt of households, firms and governments who have borrowed in euros – as the value of their income is depressed, they owe a higher proportion of their income. High levels of debt were a major factor in causing the recession, because those in debt cut back on spending on both imports and domestic goods, causing a decline in GDP. It has also contributed greatly to the lingering problem of non-performing loans burdening Eurozone banks, particularly in the crisis countries. This is an excerpt from the economic discussion document launched by MEP Matt Carthy on October 27, entitled The Future of the Eurozone. Download the full document for a referenced version of Chapter Five, above. The timing of the release of the interim findings of the Abbott Government’s Royal Commission into Trade Union Governance and Corruption demonstrated that even the Government now realises the Commission has failed to land a significant blow against the Australian trade union movement. Commissioner John Dyson Heydon’s interim report was released to little media fanfare on December 19, the Friday before Christmas. The Commission’s interim report is a product of the highly political terms of reference written by the Abbott government, and of the biased approach of Commissioner Heydon and Counsel Assisting Jeremy Stoljar. Yet it still fails to paint a picture of anything nearing widespread corruption in the trade union movement. The two relevant stories dominating the media prior to the announcement of the Royal Commission were allegations about former prime minister Julia Gillard’s role in the establishment of an Australian Workers Union slush fund more than two decades ago, and the corruption in the Health Services Union East Branch revealed by “whistleblower” Kathy Jackson, national secretary. The sustained campaign led by Liberal politicians and the Murdoch press to implicate Gillard in wrongdoing as a solicitor in 1992 fizzled out and Counsel Assisting’s final submissions to the Commission published on October 31 stated that she “did not commit any crime and was not aware of any criminality” on the part of her former boyfriend, Bruce Wilson, and his then AWU colleague Ralph Blewitt. In contrast, court actions during 2014 have revealed that Jackson – described as a “hero” by Abbott in 2012 and initially viewed by the Commission as its star witness – is the subject of litigation brought by the HSU, which is seeking to recover $1.4 million she allegedly stole from the union between 2004 and 2010. The Commissioner quietly averted his gaze in his interim report, and Jackson is mentioned on just six of its more than 1,800 pages. This approach of a Royal Commission avoiding making findings on issues that are the subject of ongoing court action is sound, and is supported by both the Commission’s terms of reference and High Court precedent, but it has not been used consistently. Heydon has produced detailed findings, including recommendations that prosecuting authorities “consider” criminal charges, in several cases involving officials from the Construction, Forestry, Mining and Energy Union that are before the courts. The Commissioner in his interim report retreated somewhat from Stoljar’s bald statements in his final submissions that officials had “committed criminal offences” after receiving spirited responses from the CFMEU and other unions which pointed out that the Commission did not have the power to make findings of guilt. The Commission was constituted 13 March 2014. After 76 days of hearings, 687 notices to produce, 239 witness appearances and $53 million of public money, the results must be disheartening, to say the least, to the Abbott government. Aside from the already known existence of corruption among a number of officials in the HSU East Branch, and the Wilson-Blewitt AWU slush fund affair, it has failed to uncover systemic – or even any other significant cases of – corrupt self-enrichment by union officials at the expense of union members. Stoljar conceded in his final submissions that allegations of CFMEU officials in New South Wales and Queensland receiving or seeking bribes were “unsubstantiated”. “The body count has been so low some in the media room took to joking about being assigned to cover [the New South Wales Independent Commission Against Corruption], where it reached double digits with 12 state or federal Liberal MPs who have resigned or stood aside,” journalist for Thomson Reuters’ industrial relations news service Paul Karp wrote on November 11. There are several cases where Heydon recommends prosecuting authorities consider charging individuals, but in almost all instances, these cases relate to industrial action. Leaving aside for the moment the approach of the Commission and the content of its case studies, it’s worth taking a look back at the highlights of the political theatre of the past year that has been orchestrated by the Abbott government and the officers of the Commission itself. From the start, Murdoch’s Herald-Sun newspaper appears to have been granted special access to the office of the Commission. A major leak in relation to the subject and content of private hearings and future public hearings in July went to several outlets, including the Herald-Sun and the Age. On 3 July 2014, the day the CFMEU’s counsel was informed that hearings the following week would include a case study in Melbourne being the Pentridge Prison site”, the Herald-Sun said there would be “an explosive video and claims of corruption, death threats and intimidation” aired in the Commission the following week. The following day, the Age uploaded video and audio recordings as part of its allegations around the Pentridge site. The same day, 4 July 2014, the Age also ran allegations it said were from private hearings. The CFMEU wrote to the chief executive officer of the Commission, Jane Fitzgerald, saying: “These events suggest that not only the subject of next week’s Commission hearings but the evidence itself has been leaked to the media.” The union called on the office of the Commission to ask the Australian Federal Police to “investigate whether anyone from the Commission has been involved in the leaking of material to the media”. Fitzgerald, and then Heydon, simply dismissed out of hand the allegation that officers of the Commission had been involved in a leak and refused to have the matter investigated internally or independently. When a female lawyer working for the Commission was physically assaulted and injured in a car park on 18 September 2014, the Herald-Sun ran the story the following morning including the line: “The commission released a statement last night exclusively to the Herald-Sun”. The attack was random and unrelated to any aspect of the Commission, and the Herald-Sun did not explicitly claim there was a connection, though it mentioned the CFMEU and “bikies” in the article. But why is a royal commission providing selective briefings and “exclusive statements” to a favoured media outlet instead of issuing a general press release? In July 2014, the ACTU was leaked a copy of a ‘scoping questionnaire’ that had been sent to all federal government departments and agencies by the Attorney General’s department asking them to disclose all contact with any union over the previous 10 years. ACTU Assistant Secretary Tim Lyons wrote in Working Life on 29 July 2014, “Although it’s notionally about the royal commission into unions, it goes well beyond the Commission’s terms of reference and seems to imply that any consultation with unions on public policy matters, and even negotiating a workplace agreement with unions representing public servants is somehow illegitimate”. Those who said the union movement’s claim that the royal commission was a politically motivated witch-hunt was exaggerated should have been forced to think twice after the Attorney General department’s demand. Brandis pushed out the reporting date by a year from December 2014 to December 2015. He boosted the Commission’s budget from $53 million to $61 million. Clearly another year of mud-slinging against the union movement will give the deeply unpopular Abbott government a better chance of winning public support for its plan to make major reforms to the workplace relations system following the Productivity Commission’s review of the Fair Work Act which began in December. It means the Commissioner’s final report will be released in the lead-up to the 2016 federal elections. The federal opposition pointed out that Brandis had taken just five days to respond to Heydon’s letter, but more than two months to respond to Justice Peter McLellan’s July actual request for an extension in the Royal Commission into Institutional Responses to Child Sexual Abuse. Brandis confirmed during Senate Estimates that “the government made the decision to extend the Royal Commission”. Then there was joint police task force into union-related crime that got announced twice – once by the Attorney General’s department in February 2014, and once more for luck on 31 October 2014, shortly before the Victorian state election. Opposition leader Bill Shorten had proposed creating a “multi-jurisdictional taskforce” in February 2014. The CFMEU has written to the police commissioners of Victoria and NSW several times since January 2014 pledging the union’s full cooperation with the police in any investigation into criminal activity in the building industry. But the theme of the Victorian state election, a contest in which the first-term Napthine government was struggling, was set. The Victorian Police Commissioner Ken Lay was informed the night before the 31 October announcement, by email, that then Victorian Premier Denis Napthine and Abbott would be holding a press conference in the morning about the joint police task force. That evening Tom Iggulden reported on the ABC News: “The Herald-Sun was, however, kept in the loop. Details of the taskforce unknown to the [police] commissioner were splashed across the News Limited outlet this morning.” The front page headline read, “Cops hunt union rats”. The task force would include up to 30 Victorian and federal police officers who would investigate allegations aired by the Heydon Commission, and report back to the Commission. All of which of course made the Liberal loss of government, ensured by a grass-roots campaign by trade union activists led by Victorian Trades Hall Council, all the sweeter. And lastly, the timing of the release of the terms of reference for the Productivity Commission’s review of the Fair Work Act – delayed since March 2014 and announced on the Friday before Christmas, minus Abbott, and just a few hours after Heydon’s interim report was released – was the final act in a year of politically motivated and orchestrated stunts relating to this royal commission. Despite the combined efforts of the government and the Commission itself, it’s fallen flat. But then, the Abbott government has given it another year to do better. Since 2011, the Liberals have viewed ‘union corruption’ as both their ticket to power and as a central tool in their attempt to condition the Australian public for their industrial relations agenda. It’s easy to forget the ferocity of the Liberal campaign against then federal Labor MP and former leading Health Services Union official Craig Thomson that was unleashed in 2011. The opposition bayed for blood and fostered a media frenzy over allegations of his corrupt behaviour as a union official in the belief that the minority Labor government, which then held power in the federal parliament by a single seat, would fall. Liberal strategists saw the opportunity to tarnish then prime minister Julia Gillard with the same brush of ‘union corruption’ by dusting off old rumours about legal advice she was alleged to have provided in connection with the Australian Workers’ Union slush fund. Weak as the evidence was, and tenuous as the ‘union corruption’ link was, it would have to do. Still apprehensive about the united and effective Your Rights at Work campaign that forced the Howard Liberal government from power in 2007, the AWU and HSU scandals combined did not quite amount to the ammunition the Abbott government needed to mount a full-scale attack on the trade union movement immediately following his election in September 2013. But the ABC and Fairfax Media stepped in to provide the government with the justification it needed to broaden its promised judicial inquiry into the AWU into a fully-fledged royal commission which targeted five trade unions and demanded the last seven years’ worth of financial, contractual and personnel records from every branch of the named unions. A joint investigation by the ABC’s 7.30 Report and Fairfax Media resulted in a series of stories being published and aired on January 28 and 29, 2014, which alleged widespread criminality, intimidation and corruption in the construction industry. Dramatic CCTV footage of Comanchero bikies apparently trying to collect a debt from the Master Builders Association’s Trevor Evans at his home opened the 7.30 Report. The reporter failed to explain how this incident was connected with construction workers or their union. Since January last year, the 7.30 Report in particular has provided a platform to anyone with a grievance against the Construction, Forestry, Mining and Energy Union (CFMEU). This has ranged from disgruntled union officials to dodgy builders, from organised crime figures with scores to settle to the head of the Fair Work Building Industry Inspectorate (FWBC), Nigel Hadgkiss. The central allegation reported in Fairfax Media in January last year was: “Union officials have formed corrupt relationships with organised crime figures, receiving kickbacks in exchange for arranging lucrative contracts in the construction industry.” The ABC alleged “systemic bribery” of union officials. The investigation claimed that six Victorian CFMEU officials had received bribes. Victorian organiser Danny Berardi resigned from his position when journalists provided evidence that he had accepted free renovation work in exchange for helping two companies get contracts. However, aside from Berardi, no other details or names were provided: “For legal reasons specific details cannot be aired,” the ABC said. The 7.30 Report ran a story on 28 January featuring an interview with CFMEU NSW official Brian Fitzpatrick who alleged that there were links between NSW union officials and companies run by alleged crime figure George Alex. The ABC and Fairfax both claimed credit for the government’s move to establish the Heydon Royal Commission into Trade Union Governance and Corruption, which was announced less than a fortnight after their joint investigation. “The scope of the inquiry was dramatically widened into a royal commission after extensive reports in Fairfax Media,” Fairfax journalists wrote in a subsequent article. Later in the year, businessperson Jim Byrnes starred in an episode of the 7.30 Report in which he claimed he had seen his rival George Alex pass an envelope, which conveniently had “$3,000” written on it, to NSW CFMEU organiser Darren Greenfield at a meeting. Byrnes’s is to date the only “eyewitness” account of a union official accepting a bribe. Greenfield denies ever having been in any meeting together with Byrnes in his life. The royal commission itself has since shown many of the claims made by the ABC and Fairfax to be either totally false or unsubstantiated. There’s a big difference between widespread corruption in the construction industry and widespread corruption in the construction union. CFMEU leaders said they were in full agreement with the view that organised crime was rife in the industry, and that they had been pressing for years for the police and the corporate regulator, Australian Securities and Investments Commission (ASIC), to investigate criminal activity. 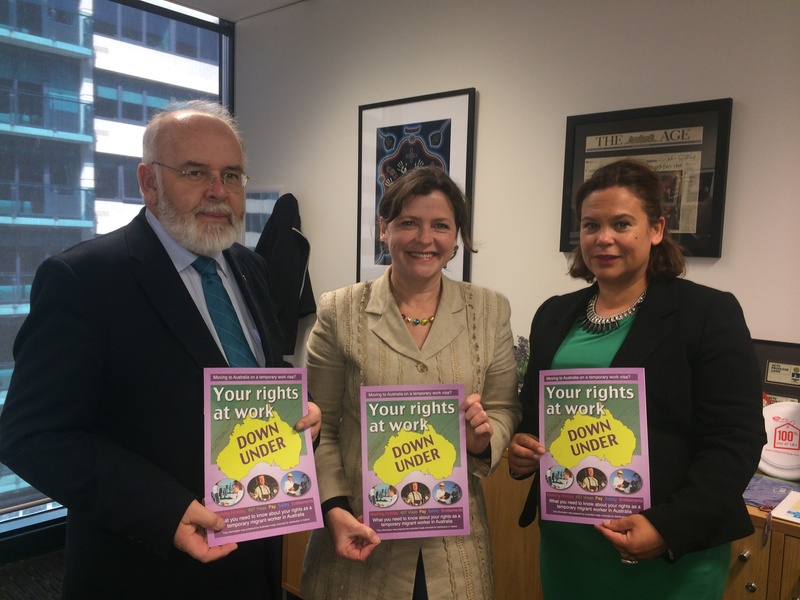 It also pointed out that the union plays “no part in deciding whether particular labour hire companies got contracts on construction projects,” nor is it “in a position to check the property, or other interests or connections of employers and managers of companies”. Before the Fitzpatrick allegations about CFMEU officials in NSW collaborating with George Alex were publicly aired, the claim was already the subject of an internal union investigation and the NSW branch of the union had recovered $250,000 in unpaid workers’ entitlements from Alex companies. Jim Byrnes, who later repeated his allegations before the Commission following his September appearance on the 7.30 Report, admitted on air that he had fallen out with Alex and said: “I’d like to see him in prison. Cause I’d like, I’d like him to have someone just lean over his shoulder and whisper my name in his ear.” Byrnes served time in jail for supplying heroin and assault before acting as an adviser to notoriously corrupt and bankrupted businessman Alan Bond, and has been banned by ASIC twice from managing companies. An allegation – reported as fact by the Herald Sun in August 2014 and repeated by Victorian Police Assistant Commissioner Stephen Fontana to the Heydon Royal Commission in September 2014 – that one of the Comancheros collecting a debt in the 7.30 Report’s January 2014 footage, Norm Meyer, was a CFMEU official, was categorically denied by the union. Fontana claimed in the Commission that he had police intelligence that showed several “union officials” were “members of outlaw motorcycle gangs”. In a cross-examination by CFMEU counsel John Agius, which really ought to be immortalised in song, Fontana admitted that by “union officials” he meant “union official”, specifically Norm Meyer, and by “police intelligence” he meant a photo of a union rally he had seen in the Herald Sun. Fontana then conceded under questioning that no CFMEU official had ever been charged with blackmail, corruption or drug crimes despite his opening claims that he believed union officials were involved in these crimes. This didn’t stop the Herald Sun from running an utterly dishonest editorial on 20 September 2014 in which Fontana’s initial claims, but not his retractions, were reported. It was titled, “Muzzle union things now”. And as for Andrew Zaf, he has emerged as the most thoroughly discredited witness to appear before the Commission yet, with the exception of Kathy Jackson. The trip by Gerry Adams to Australia that Zaf referred to was organised independently by Irish solidarity organisations, not by the CFMEU, and the international air fares were purchased by Sinn Féin’s Belfast office. Zaf had claimed in January that he paid for the trip that occurred in 1999; before the Commission on 17 September 2014 he said his records from ANZ Bank show he had written a cheque for $10,000 in 1997, and moments later he said he wrote this cheque prior to 1994. It’s on the public record that Adams was denied an entry visa to Australia until 1999, after the Good Friday Agreement was signed in 1998. In July Zaf told the Commission he had “no personal enemies” only to be threatened by Hells Angels over a disputed debt four days later. In his September appearance Zaf was forced to deny having pulled a gun on then CFMEU organiser Maurice Hill in 1994. Evidence was produced showing the Victorian Trades Hall Council had passed a motion condemning the incident at the time. Finally, in November, Slater and Gordon lawyers acting for the CFMEU wrote to the Commission enclosing a statement from Victorian Trades Hall Council Secretary Luke Hilakari that included information about Zaf from a former associate that challenged the evidence he had provided to the Commission. Heydon agreed to omit any reference to Zaf’s allegations from his interim report. So what was actually demonstrated by the ABC-Fairfax joint investigation was that motorcycle gangs and organised crime figures are involved in the construction industry, and that one junior CFMEU official acted corruptly and immediately resigned after the union leadership was made aware of this. Hardly a justification for a royal commission into the entire trade union movement. Generally when a media outlet claims it cannot publish specific details or name names for “legal reasons”, that means it doesn’t have the evidence to back up an allegation that could withstand a defamation suit. Given the dubious quality of the “whistleblowers” the ABC and Fairfax are relying on for these “specific details”, and the unbelievably woeful fact-checking of the journalists, you’ll forgive me for looking at their entire investigation with a healthy amount of skepticism. These sensationalist, poorly researched and unsubstantiated articles, which were enthusiastically seized upon by the Abbott government to launch the Heydon royal commission, should be a source of embarrassment to the ABC and Fairfax Media, not a source of pride. 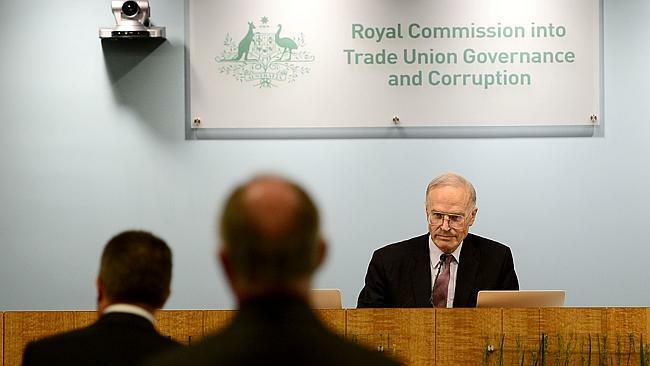 Releasing the interim report of the Royal Commission into Trade Union Governance and Corruption on December 19, Employment Minister Eric Abetz said the findings showed the decision to hold a royal commission into unions had been “vindicated”. But if almost every substantial case examined by the Heydon Commission was already making its way through the legal system, surely that suggests the system was working. A royal commission is a tool the executive arm of government can effectively employ when there is a serious failure by the existing regulatory system. Counsel for the CFMEU in the Commission, John Agius, pointed out in his oral submission to the Heydon Commission in November that the role of a royal commission “traditionally and [which] ought still to be the case is one of using its coercive powers to discover evidence that might not otherwise be available to investigative bodies”. In December 2013, three months after his election, Liberal PM Tony Abbott announced a royal commission into the former Labor government’s home insulation scheme in which four installers died, and announced the Heydon royal commission into unions in February 2014. Kevin Rudd is the target of the first and Julia Gillard one of the key targets of the latter. 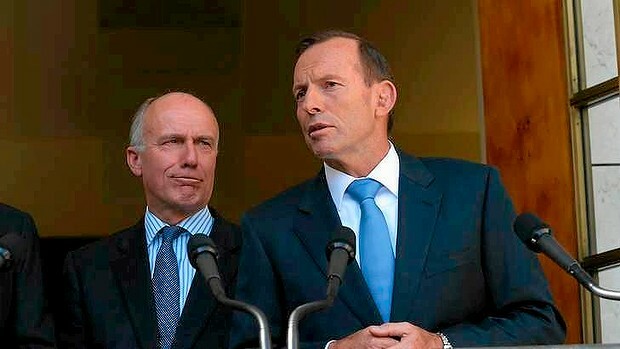 Even former Liberal PM John Howard publicly reprimanded Abbott over the blatantly political use, or misuse, of the royal commission as an instrument of government in a September 2014 Channel 7 TV interview, pointing out there had already been a coronial investigation into the home insulation scheme. “I’m uneasy about the idea of having royal commissions or inquiries into essentially a political decision on which the public has already delivered a verdict… I don’t think you should ever begin to go down the American path of using the law for narrow targeted political purposes,” Howard said. Admittedly, this was a bit rich coming from the man who had established the Cole Royal Commission into the building unions that cost taxpayers $60 million and did not result in a single prosecution of a union official. As the Australian Congress of Trade Unions (ACTU) has repeatedly pointed out, every Liberal government in power since 1972 has held a royal commission into trade unions. There are several areas of Australian corporate and political life that are plagued by systemic failures and which the public would benefit from an inquiry with coercive investigative powers being held. Two examples here will suffice. The Abbott government’s political mantra since coming to power has been that there is a need to drastically cut public spending in the healthcare, education, welfare and community sectors in order to repair the federal budget deficit. But a report released in September 2014 by the United Voice union and Tax Justice Network Australia revealed that of the ASX 200 companies, almost one-third pay less than 10% tax when the statutory rate is 30%, and 57% have subsidiaries in tax haven jurisdictions. This systemic tax avoidance by major companies results in the loss to the public purse of $8.4 billion in revenue each year, the report estimates. This report was followed in November 2014 by the revelation that dozens of Australian corporations including Lend Lease, AMP and the Macquarie Group were among the 343 companies who struck deals with Luxembourg to shift profits through tax havens and used accounting giant PriceWaterhouse Coopers to drastically cut the amount of tax they paid – in some cases reducing it to almost nothing. But not only has the Abbott government avoided ordering a royal commission, or any kind of inquiry, into what is clearly a systemic problem that has massive implications for the Australian public – it has dropped its pledge to take any action on tax avoidance whatsoever. In November 2013, Treasurer Joe Hockey declared that the government would not legislate the former Gillard government’s plan to reduce tax minimisation by abolishing the loophole of generous deductions being available under sections 25-90 of the Tax Assessment Act 1997. Its abolition would have boosted public revenue by around $600 million. Hockey said in the 2013-2014 Mid-Year Economic and Fiscal Outlook (MYEFO) report that this would place “unreasonable compliance costs” on such companies, and pledged to “introduce a targeted anti‑avoidance provision after detailed consultation with stakeholders” instead. But in the 2014-2015 MYEFO report announced in November, the Treasurer quietly dropped even this watered-down pledge to tackle tax avoidance and minimisation. Of course, the most glaring double standard of all when it comes to the use of a royal commission is the Abbott government’s failure to establish one into the systemic failures of corporate regulator the Australian Securities and Investments Commission (ASIC), particularly in relation to its investigation of the actions of the Commonwealth Bank’s financial planning subsidiary CBFL during 2006-2010. More than a thousand CBFL customers lost millions of dollars during the global financial crisis after their bonus-seeking advisers invested their money in high-risk products without their clients’ permission. The Commonwealth Bank’s attempted cover-up and the ASIC’s incompetence on all fronts was the subject of a five-month inquiry by a Senate Committee that reported in June 2014 – specifically recommending that a royal commission be held into the ASIC’s failures. The Abbott government rejected the recommendation. The fact that Howard’s hated Work Choices reforms remained so politically toxic six years after he was booted from office meant that Abbott – under pressure from business groups to impose restrictions on collective bargaining and union power, cut penalty rates and much more – made an election promise that the Productivity Commission would review the Labor government’s Fair Work Act that replaced Work Choices within the Coalition’s first six months of government. Any proposals for change arising from the review, he said, would be brought to the electorate in the 2016 elections before being implemented. The draft terms of reference of the Productivity Commission’s ‘Workplace Relations Framework Review’ were leaked in March last year, and it was initially due to report in April 2015. But the government delayed the announcement of the very same terms of reference for nine months, making a weak excuse about having a lot on its plate, and conveniently waiting until four state elections were over. The claim that Coalition politicians have been repeating for years – that labour productivity has been consistently declining as a result of the Fair Work Act, while at the same time Australia is experiencing a “wages explosion” – don’t stand up to a moment’s scrutiny. Australian Bureau of Statistics data shows that labour productivity has increased by 8% from March 2011 to March 2014. But wage growth was at 2.6% in the year to September 2014, barely passing the inflation rate of 2.3%. The facts are undermining the conservatives’ traditional economic justification for their ideological agenda. Something more is needed. 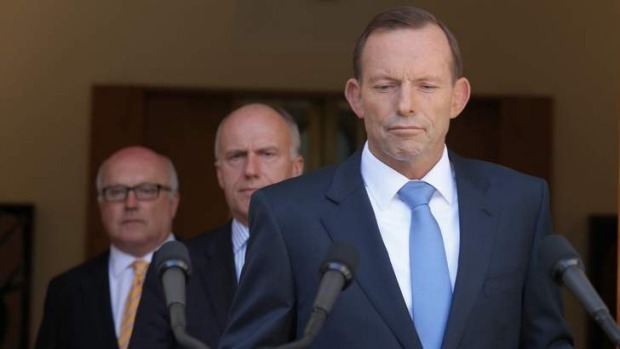 Just as the so-called Commission of Audit (October 2013 – March 2014) was used by the Abbott Government as an attempt to provide political cover for its first budget, which provoked still-lingering outrage among the Australian people last May, the government lives in hope that the union royal commission will provide justification for its main game – the implementation of the anti-worker reforms that will inevitably come from the Productivity Commission review. The more mud that is slung at the union movement, the weaker the potential resistance to these reforms will be. If anyone had any doubt that this was the government’s strategy, it has surely been dispelled by now. Abetz announced the publication of the interim report by the Heydon royal commission on the morning of 19 December 2014. The same afternoon, Hockey finally announced the terms of reference for the Productivity Commission’s review, ensuring that if it was covered by the media at all it would inevitably be reported in the same breath as the term “union corruption”.